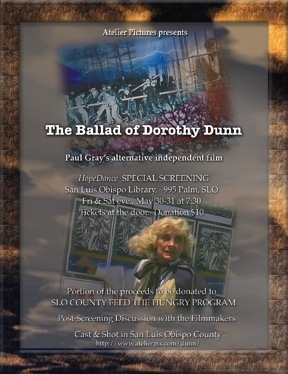 HopeDance hosting a special screening of Paul Gray's alternative independent film, The Ballad of Dorothy Dunn. An agitprop music-drama set in 1930's California during one of the most turbulent labor strikes in American History. A Catholic activist (character inspired by the legendary Dorothy Day) seeks to steer a humanitarian course through the clashing rocks of right and left with advocates. Expressionistic multimedia techniques - original songs, motion graphics, headlines, radio broadcasts and newsreel clips add insight into the narrative. Tickets at the door. Donations $10.